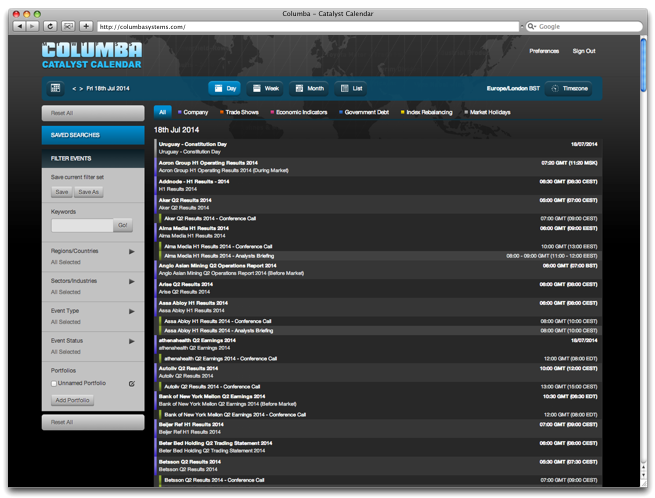 Columba is the leading provider of highly accurate international future financial event data and sophisticated enterprise event calendar systems to both sell-side and buy-side institutions. Our customers include the world's largest investment banks, leading fund managers and hedge funds. Our innovative products and solutions are designed to be flexible, scalable, secure and easy to implement and maintain. Columba offers a range of innovative products and solutions including web based calendar applications; secure enterprise calendar solutions; XML data feeds; synchronization with MS Outlook™ calendars and Blackberry™ devices and data extracts in Microsoft Excel™ format. Columba employs a large team of experienced analysts who collect highly accurate and detailed information about upcoming financial events for listed companies in North and South America, Europe, Asia, Middle East and the Emerging Markets. © 2011 - 2015 Columba Systems.